Abstract: This paper seeks to delve into violent radicalization. Regarding all the possible questions about violent radicalization that ends in terrorism, this paper will focus on the “why” and the “how”. First, the paper will examine the benefits of using graphic information backed by text as the preferred way to approach complex problems instead of relying exclusively on long text reports. Second, in chronological order, previous models explaining violent radicalization will be briefly analysed. Third, two models of violent radicalization that end in terrorism will be proposed, leveraging new research while seeking to avoid the drawbacks of the previous works. These two models will maintain the positive aspects of previous works, discard the old and outdated aspects, and will add the most recent research tendencies. Therefore, the reader will find in this paper a complete explanation about how and why a person becomes a violent radical. However, in order to maintain a reasonable length, certain details have been left for another more in depth research paper. Accordingly, although the proposed models have several layers, this paper will focus on only the outer ones. The paper shows the complexity of this problem. But complex does not imply impossible to solve. The paper will provide a comprehensive idea of the dynamics of the problem and will give the reader the opportunity to decide if the situational understanding acquired is sufficient. In the event he or she wants to progress deeper into the topic, the complete model offers consecutive inner layers that will provide the reader increased in depth knowledge. All the information discussed in this paper is soundly backed up by previous research, with nothing left to opinion. Violent radicalization that ends in terrorisms is an ‘Ill-structured problem’ which are complex, nonlinear, and dynamic. Among the three kinds of problems that decision-makers or commanders tackle, they are the most challenging to understand and solve. Four points are important to success when handling violent radicalization matters since ill-structured problems have the abovementioned issues. First, a good problem-solving process and methodology to assist leaders in managing or solving those problems. Second, a set of tools that can be integrated into the problem-solving process (plan, prepare, execute and assess) and work finely within it. Third, to gain the necessary and sufficient situational understanding in order to frame and decide correctly. Fourth, to develop comprehensive approaches. Observation and positive identification of an unacceptable situation. Visualize how to solve it (conceptualize). Assess achievement of the ends. Image 1 (author): Solving problem general process as per US/NATO and EU defence and security forces. Each different kind of problem requires its particular techniques and amount of effort to understand it. Understanding complex problems means comprehending the situation´s inner relationships. This implies that the comprehension is to be holistic; it is not enough to understand just a part of the problem. In trying to solve complex problems, the most apparent ‘solution’ may create more problems. Violent radicalization that ends in terrorism is a complex problem that has multiple variables and trying to fix the whole problem by just acting on one part of it without taking into consideration the relationships and second and third order effects amongst its components is the perfect recipe for security failure (e.g. removing poppy fields in Afghanistan without providing an equally-lucrative or almost comparable alternative way of earning a living). Long text reports are not the best option to frame, understand and establish the ways to achieve the desired end state for a complex problem with multiple roots that requires managing multiple operational variables to fix it. Trying to explain complex problems in a traditional way (long text reports) demands much more time and effort than using graphic information and judgement. Image 2 (credits US Army): cognitive hierarchy as understood in several US and NATO doctrine publications. Additionally, in long, large and complex projects, understanding what others have done is essential. People co-operate more efficiently if their area of expertise is easily understood by all others. Long text reports do not stimulate collaborative/team work. 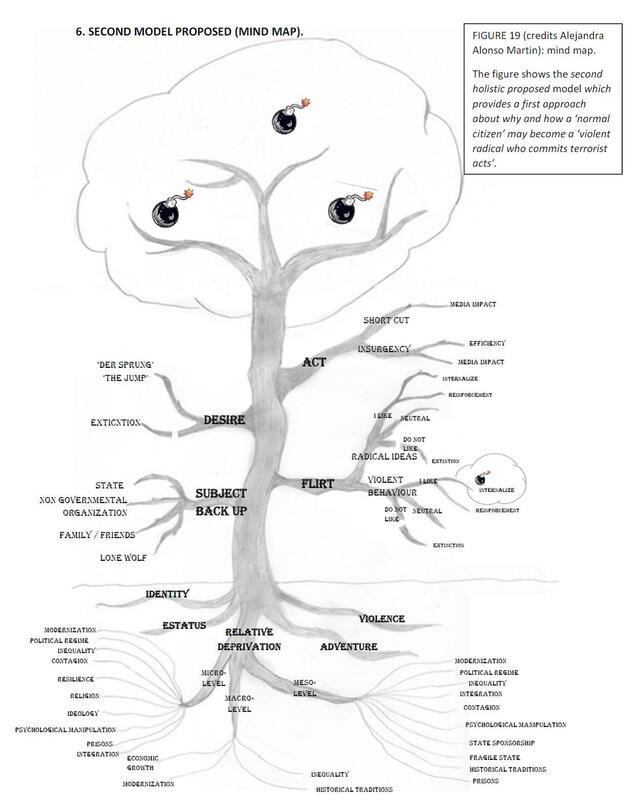 The mandatory subject matter experts that are to manage all the specific areas of the complex problem will find the ‘data’ and ‘information’ isolated and linearly distributed along the text but not displayed altogether, which is problematic to establish relationships, which hampers a holistic approach. This leads to formulating a partial solution that results in policy failure. Graphic information has been already processed, analysed, synthetized, compared and gone under a process of induction and deduction to finally be displayed in a friendly way. In this sense, graphic information is time saving and can display ‘understanding’. Some graphic solutions can combine both mathematical strictness and ergonomics (making something exhausting and boring, like long text comprehension, more easy and comfortable to process). Among disciplines that use graphic information, there is one especially interesting for our purpose: System dynamics. System dynamics was precisely developed to frame, understand, and discuss complex issues. The analysis and approach is done in a comprehensive manner in search of understanding its structure, the interconnections between all its components, and how changes in whatever of its constituent parts will affect the whole system. A system can be broken up into smaller systems or even parts but the key point of system dynamics is understanding how all the objects in a system interact with one another. The system dynamics approach allows one to consider second and third order effects, to study the centre of gravity of the constituent parts, and to study the centre of gravity of the whole system. Image 3 (author): A system can be broke into small systems and components. Even whether or not the user does not know how a sub-system works, he can identify inputs-outputs and relations. Image 4 (author): displayed in a different and more familiar way than previous figure, a system of systems. Each sub-system (e.g. : variables of the operational environment) has its relationships, actors, functions, tensions and also can be used to study centres of gravity. It is not the main purpose of this paper to make an in-depth explanation of the advantages of using graphic information. However, it recognizes that (in both civilian and military decision-making) different techniques have been developed that employ and display graphic information to tackle complex problems. These include, for example, mind maps, flowcharts, decision support matrices with colour codes, influence diagrams, and the common operational pictures that are utilized at tactical or operational operations centres. Since the first attempts by government (legislative, executive, and judiciary branches), security agencies, and academics to define the terms ‘radicalization’, ‘violent radicalization’ and ‘extremism’, there has been a lot of evolution and improvement. Nevertheless, there is still a lot of confusion regarding these topics. ‘Radicalism’ is a sufficiently large conceptual category and needs to be used with caution. In this concept there is room for both violent and non-violent people (who do not represent a problem in and of themselves). Violent radicalization is definitively a problem since the monopoly on violence (the legitimate use of physical force) falls in the Governments and not in the individuals. Image 5 (author): Radicalism conceptual category. ‘Violent radicalization’ is frequently associated with radical interpretations of Islam, which is wrong. It is important to understand that violent radicalization could be found in almost every field of life, e.g. economics (anti-establishment, etc. ), politics (left wing, right-wing, supremacists, etc. ), cultural (sports-hooligans, segregationists, etc. ), religion, etc. «Dynamic, reversible, gradual and individual process that leads a person to adopt very different (which may end up being extreme) beliefs and/or goals compared with those of the surrounding environment. During this process, the violence, in any of its meanings (physical, moral, terrorism, etc.) is legitimated as mean to achieve the end. The process concludes when, whether by adaptation of conduct or beliefs, the subject has the conviction and will to commit violent acts». Violent radicalization falls into other scientific disciplines like psychology, law, international relations, politics, sociology, etc. If we desire success in combating it, different subject matter experts need to be employed to help address the problem. Any approach with regard to violent radicalization has to be comprehensive not only because of its multiple dimensions regarding scientific disciplines but also principally because the actors, factors, relations and tensions that make up the system are interconnected and changes in any of its constituent parts will affect the whole system. Besides the abovementioned, violent radicalization requires not only a comprehensive approach but also should be analyzed and addressed at different levels: macro, meso and micro. To consider only the «cognitive way» as the only one to become a violent radical. In short, the «cognitive way» starts by exposition to a discourse that justifies and glorifies violence, then the individual internalizes the arguments provided by that discourse and finally changes behaviour. On the other hand, the «behavioural way» goes through an individual’s exposure to violence. For different mechanisms and reasons the individual starts committing violent actions, then the subject justifies his own violent actions, and finally the person internalizes and assimilates violent discourse and changes his/her ideas. In this sense (it will be discussed later), to consider only one of the two possible ways means to have addressed only half part of the problem. To be designed for a specific kind of radicalization, which means it is difficult to use as general rule or for other types of violent radicalization. Not to be scalable. The models provide general information but if you want more details or a complete explanation there is no option; you are obliged to go to the text. To have limited the construction of the model to only one level of analysis (generally micro-level), without taking into account other levels such as macro and meso-level. Wiktorowitcz uses in his model the analogy of a funnel to display the fact that there are a lot of people under the same stimuli but only a few become radicals. He introduces the fact that there must be exogenous conditions to initiate the process, giving some important and supported clues about WHY a person becomes a violent radical. Another interesting point of this model is that it considers the existence of factors that can catalyse the process, like member activism. Image 6 (as quoted in Schmid 2013:23): Wiktorowitcz model. Only the cognitive way has been considered. The model is the product of a case study that uses al-Muhajiroun as the only source, which methodologically implies some issues making it difficult to ‘export’ it to other types of violent radicalization, which may or may not follow the same rules. In the same sense as the previous point, this model is tied to religion. However, violent radicalization is not only a matter of religion. Finally, it does not explain properly the self-radicalization itself or the existence of lone-wolves. Image 7 (author): Moghaddam staircase to terrorism model. On one hand, this model is interesting because the terrorist act is seen as a process that can be bidirectional. It also gives some clues about the psychological steps that one subject may follow to commit to executing acts of terrorism. The approach is only psychological. There are no other scientific disciplines involved. The model is ideas-centric and does not consider behaviour as a possible route to extremism. «The model is intended to provide a general framework within which to organize current psychological knowledge and to help direct future research and policy; it is not intended as a formal model to be tested against alternatives». 4.3 UK Association of Chief Police Officers (ACPO) model (2007), in response to the previous Labour government’s Prevent Strategy, which was launched in 2007. This model uses a pyramid to indicate a proportional approach to defining those who break the law. In particular, it highlights that only a few subjects achieve the apex, providing a strong case for a general rule that amongst the majority of people under the same stimuli, only a few become violent radicals. The model distinguishes four tiers related to personnel. The character of the people in each of these tiers is linked to the approach of the government, which somehow distinguishes the initiatives among the macro, meso and micro levels. There is also an interesting point highlighted, a thin red line differentiating the ones who ‘actively break the law’ from the others. The weaknesses of the model is that it mixes ‘extremism’ with ‘violent radicalization’ and also it does not explain HOW and/or WHY a subject ascends from one tier to other. Image 8 (author): UK ACPO model. 4.4 The New York Police Department, NYPD’s four-stage radicalization process (2007). This model was developed after studying in-depth 11 terror acts committed by Al Qaida-influenced violent radicals, which ties the model to a specific type of violent radicalism and therefore could compromise it methodologically to represent a more generic violent radicalization process. While the authors state that process can be abandoned at any stage, only some clues about this option are given. The graphic model (image 9) does not provide much information itself, although the report contains a lot of evidence with respect to the underlying factors of violent radicalization. Image 9 (author): NYPD model. Although Sageman performed a wider analysis, his model is also Al Qaida related and ideas-centric which provides the same problems as previous models. However, the model introduced two important ideas to explain why only a few become violent radicals. First, the ‘moral outrage’; a perception and feeling that make a difference among those who are in the process. Second, ‘specific interpretation of the world’; radicals see the world differently than the average person, which points that the radicalization is a ‘relative concept’. Image 10 (author): Marc Sageman’s four-stage process. Image 11 (author): Taarnby’s eight-stage process. Due to the fact that the model uses the Hamburg cell as the only case study, it is difficult to use it for other types of violent radicalization. This model is, in a way, an evolution of the Sageman´s four stage process. The model does not detail specifically what the ‘process of radicalization’ is but an interesting point is how the ending point is framed (as stated, ‘going operational’). This emphasizes how what was just ‘an individual’ in the beginning of the process has by the end of the process become ‘a threat’ that can put at risk persons, assets or values. 4.7. Pretch´s model of the process of radicalization – from conversion to terrorism (2007). Pretch conducted a broad quantity of research to present his model. He maintained the four traditional stages but enriched them. He provided some important hints about motivations, triggers and catalysts. The model is not actually graphic and was presented, in his original work, as a table, intending to express a timeline with the four phases of the violent radicalization process. Some drawbacks to this model are that although it is presented in graphic mode the model is pure text, so it is necessary to read it all to understand the whole process. Curiously, although he delinked radicalization from religion in its definition, the model is bounded to one religion, which makes it less easily applicable or characterized with other violent radicalization (e.g. left/right wing violent radicals). Besides there is limited space for lone wolf action, a common threat at present, because the model considers training and indoctrination an integral part of the process, inclusive of travel to other places. «[M]ultiple and diverse pathways leading individuals and groups to radicalisation and terrorism» (2008: 429). Both authors went deep into an important question: how do individuals move from the base of the pyramid to the apex, based on the previous ACPO model? What specific factors contribute to this movement? What is really important and key in this question is that it considers how the same stimuli only served to transform a few to become violent radicals. Instead of presenting a diagram that explained HOW and WHY a subject went through the process of violent radicalization, they simply presented the mechanisms of political radicalization. A remarkable aspect of their work was to point out that it is possible to not only radicalize individuals but large groups of people as well. They also identified different ways of radicalization which they grouped into three sets. Image 13 (McCauley and Moskalenko 2008:418): Original table, mechanisms of political radicalization. Important social psychological factors at each stage. 4.10. Doosje, Moghaddam, Kruglanski, de Wolf, Mann and Feddes (2016). Doosje et al presented this graphic model of radicalization in 2016. 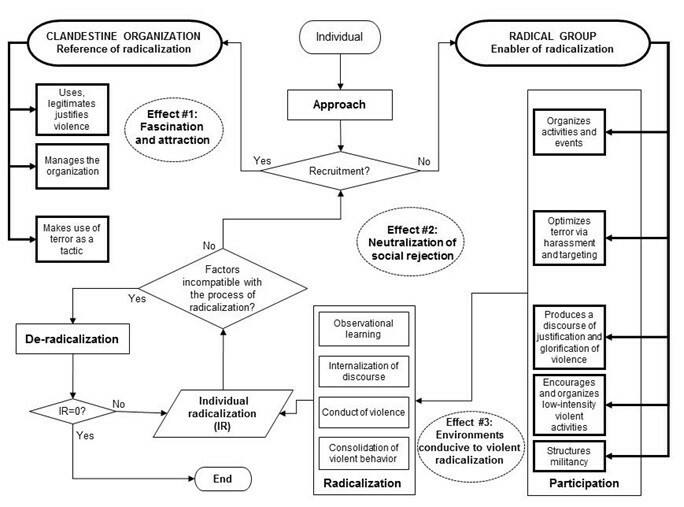 Image 14 (Doosje, De Wolf, Mann and Feddes 2016:80): The (de)radicalization process and its determinants. A clear depiction of the reversibility of the process and also the analysis of the three levels (micro, meso, and macro). Identified the aspect of resilience as key to the process in both radicalization and de-radicalization. The model is person-centric. This does not disregard the possibility of radicalizing groups, but it does explain the fact that only «few radicals venture to terrorism». The definition of ‘radicalization’ which is confused with ‘violent radicalization’ and could lead to serious legal issues. Another weakness of this model is that it only considers the «congnitive way» that starts by exposure to a discourse that justifies and glorifies violence. The individual then internalizes the arguments provided by that discourse and subsequently changes their behaviour. Phase two indicates that a natural step in the process is that the person joins or belongs to a violent radical group. However, all violent radicals do not necessarily join a radical group formally. Because of that, the model fails to provide an explanation about two small but important groups (sometimes they may be the same set), namely ‘lone wolves’ or the ‘self-radicalized'. The model is not scalable. It lacks sufficient layering to explain inner dynamics. Peco proposes a model that can explain a wide range «of observed phenomena, accommodate apparent exceptions, and obtain testable consequences». It uses a systemic approach (sees the problem as a whole). Considers radicalization not only as a matter of ideas but also as behavioural learning. The model is scalable (in a limited fashion, but at least Peco´s work recognizes two layers) and provides additional details if the reader/decision-maker requires more in depth explanations (e.g. how the the subject ascends his/her level of radicalization). Contemplates the topic as a process and provides important clues about the aspect of reinforcing ideas/behaviour, which had been previously discussed as ‘resilience’ in the Doosje et al model. The flowchart can be difficult to follow and methodologically some points need to be addressed (e.g. no ways out). A better graphic design would be better. It is difficult to explain the issue of ‘lone-wolves’ or ‘self-radicalized’ individuals with this model. It does not give any explanation about WHY the subject is radicalized. Although it is a holistic approach, it only considers one level: the micro. The meso and macro-level are not reflected on the diagram. This lack results in little room to address radicalization as a response/reaction when a group of citizens finds itself in an internal conflict with the dominant state/ruler. Image 15 (Peco 2016:6): Peco´s violent radicalization model. Image16 (author): Flow chart (using DRAKON language and system dynamics approach). The figure shows a complete and holistic proposed model which explains, in this layer, the whole process starting from a ‘normal citizen’ who will end becoming a ‘violent radical committing terrorist acts. Albeit the whole process can be understood, each action box calls another diagram (inner layer) that explains in detail part of the process (subsystem). In the outer layer of this model, the reader will find primarily HOW one subject can become a violent radical. The answers to the question WHY may be found in the inner layers (there are several more, 35 in total, not presented in this paper). Unlike most of the previously published models, this model depicts the process in two ways: through the accommodation of ideas or through the accommodation of behaviour. This is important because only considering violent radicalization through the internalization of radical ideas (the most popular belief) limits the investigator to observing only one side of the process. This first way is the most known. Changing the beliefs/ideas of the subject leads to a change in its behaviour and leads to the use of violence. It is outside the scope of this work to define terrorism itself nevertheless, for this paper, terrorism can be described like a form of violence. Certain conditions or prerequisites that promote and/or allow violent radicalization must have been set; e.g. radical ideas available. Necessary but not sufficient condition. The subject must have contact with the preconditions. If the subject does not have contact with the preconditions, nothing happens. Both sets (radicals and non-radicals) must cross paths. To continue the process, it is necessary that the individual interacts with a group that espouses radical ideas or violence, whether through two-way dialogue or solely through the one-way receipt of ideas (e.g. social media following and internet searches). Necessary but not sufficient condition. The subject must internalize the idea. Even if the subject has passed the previous phase, contacted with preconditions and discovered new ideas, he/she needs to decide if the new radical ideas are good for him/her or not. This is a relatively complex process itself that is explained in the inner layers of the model. The rapidity of this process depends on each individual; it can be said that this process is like a chemical reaction that can be catalysed. But the point is that it is measurable and can be described and explained in detail. Once the subject has internalized the radical idea he/she has become a radical, which is necessary step but not sufficient to become a violent radical who will commit terrorist acts. During the next step the subject fights an internal struggle. The key point for the subject in this phase is whether to move forward or not. It is a pure question of commitment and will; resilience plays an important part here. At this decision point, the subject judges the pros and the cons of his/her future acts. Once the subject has decided to act, the individual has become a violent radical. The only space between him/her and the terrorist act is the final decision of how, when and where to carry out the violent act. The last step of the process is important in determining the ways and means to counter violent radicalization. There are multiple methods and different purposes in committing terrorist acts. Some methods require technical skill and knowledge with more complex infrastructures, e.g. suicide vehicle borne improvised explosive devices (SVBIED). Other options are much simpler and attainable, e.g. the use of a vehicle as a weapon (trucks and cars used to run over pedestrians). The second way is the less known or considered manner. This way is tied to the learning theory called ‘behaviourism’. In accordance with Lang (1968), responses and behaviour are considered to manifest through: cognitive, physiologic and/or motor systems. Instead of learning/changing ideas first and then change/adapt behaviour, the subject learns/changes his/hers behaviour first and then changes/adapts his/hers ideas. Therefore, unlike the first path where other more traditional learning theories take place (learn ideas and then change behaviour), in the second path, the ‘stimulus-response’ in the relationship between violence-behaviour is what drives the learning. It is of the utmost importance to understand the real leverage of this path due to the fact that the violent radicalization that ends in terrorism happens mainly in fragile states where violence, in whatever of its forms, is present in a daily basis. In the most developed countries, the press and media tend to exacerbate terrorist actions and this tends to influence our perception about the locations where the most terrorist actions take place. Image 17 (credits Global Index Terrorism, GTI 2017): five most impacted countries in terrorism in accordance (the GTI always displays records of the previous year). Image 18 (credits The Fund for Peace): Fragile State Index 2017, countries ordered by colour code. The process of becoming a violent radical by changing behaviour is shorter than the previously described method. It has three stages; the first two are common, as illustrated in the flow chart. There must be certain conditions/prerequisites that promote and/or allow violent radicalization, e.g. violence in any of its forms. Necessary but not sufficient. The subject must have contact with the preconditions. Necessary but not sufficient. The subject has to internalize the behaviour. Once the subject behaves violently the process has finished. All that is required to sustain this level is to change the subject´s ideas to make him/her more resilient to de-radicalization. This model can be used to portray WHY and HOW one individual, one ‘normal citizen’ can become a violent radical. The model is not intended to be used during planning processes (neither operational nor strategic). The model is not envisioned to be used in policy making or decision making either. This model should be used during teaching, learning and research. 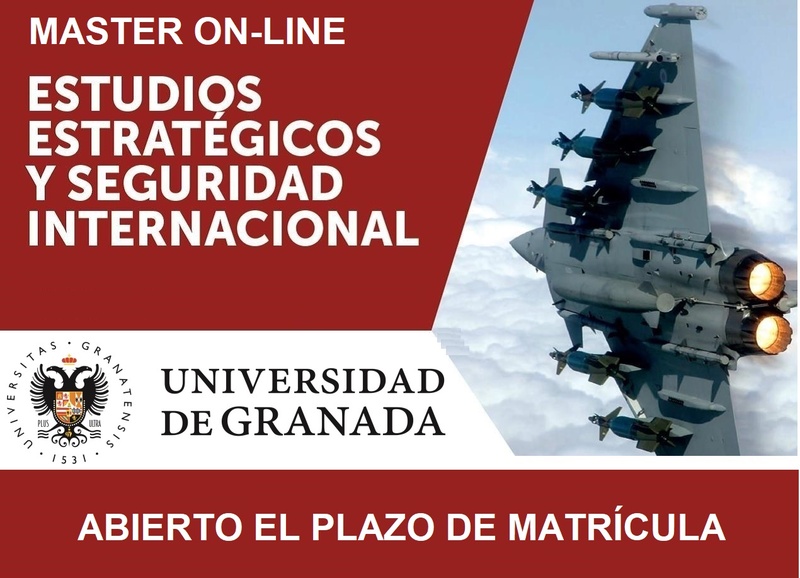 The source of power of the model is its capacity to show in a friendly way all the actors, factors and variables that can intervene into violent radicalization which ends in terrorism. It also provides the professor the opportunity to introduce one by one these items while permitting the establishment of a pre-eminence among actors, factors and variables. Besides, this model allows creative thinking and permits the reader to identify relationships among the items in this very complex and ill-structured problem. The model can be used to easily introduce the necessity for tackling the issue in a comprehensive way; not only employing system dynamics but also employing different scientific disciplines (inclusive of subject matter experts) and resources (macro, meso and micro level) to address the problem. First, the underground (roots). In an intuitive way the model depicts the underlying causes of the violent radicalization, explaining in the most plausible way WHY the process occurs. Second, above the ground (trunk and branches). Climbing the tree, branch by branch, the model explains HOW a subject can become a violent radical that finally employs terrorism tactics. The model seeks to communicate and make the process of understanding easier for teachers, scholars and for non-expert audiences. The prerequisites or conditions that must have been set; a fertile breeding ground where the violent radicalization can grow. Who is/are the subject/s and does he/her having support? This introduces group dynamics that can prevent, assist or produce different effects in the process of radicalization. 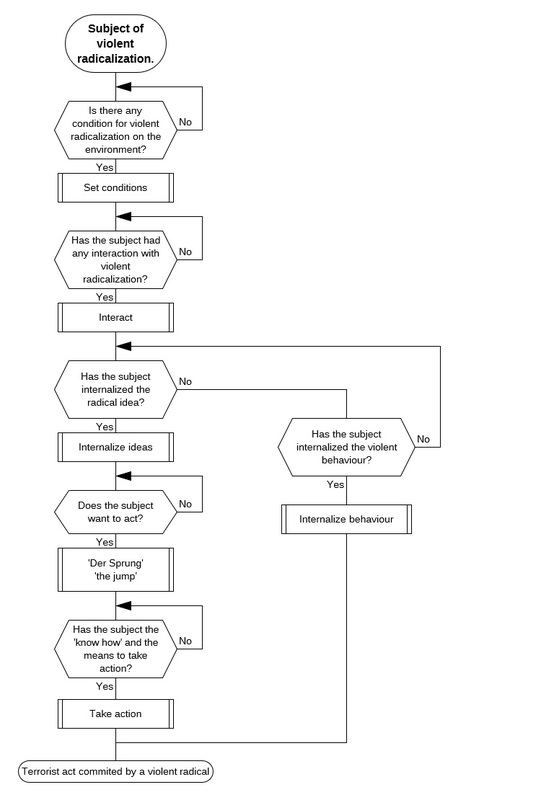 The subject interacts with ‘ideas’ or ‘violent behaviour;’ a rough cut of the mechanism to internalize ideas or behaviour is shown. At this point, if behaviour is internalized, terrorist acts can be committed, resulting in a path ending (depicted with a bomb). The cognitive way continues. The subject may have reached the conviction that radical ideas are good but still may have to embrace the option to carry out violent acts. Once he has decided to carry out violent acts there are only a few decisions left. When, where and how the violent/terrorist act is going to be committed. Both models have a solid scientific research that back them up which is important, especially the one intended for planners and decision makers, enabling solid reasons to allocate means from one place to another (ways) in order to achieve a goal (ends) in one strategy. In any case, both models are living processes that are open to review and modification in order to adapt to specific situations. They save comprehension time. In keeping with cognitive hierarchy and learning theories, graphic models are more efficient than text. They are designed to facilitate rapid understanding of the general process. This project was intended from the very beginning of its design to leverage graphic models because they are clear, friendly, well-structured, easy to understand, and useful. They provide a comprehensive and complete overview of the process. They will answer WHY and HOW a subject can become a violent radical that employs terrorist tactics. They are current and up to date. The latest research has been incorporated. Previous concepts or interpretations that are outdated or can lead to international law conflicts or misunderstandings have been eradicated (even some very popular). They include the possibility of become a violent radical through the behaviour theory. Most explanations provide only superficial details about this potential process or do not even consider it, instead remaining ideas-centric, which limits consideration to only half of the problem. However, the ‘behavioural way’ needs to be taken into account not only because many terrorists in the US and EU come from places where levels of violence are high sky but also because the highest frequency of global terrorist acts are committed in such places. The behavioural path is the one followed by those who live in conflict areas and coexist with violence on a daily basis. The levels of tolerance of violence for some people in these areas may increase step by step and this kind of ‘abnormal behaviour’ (violent behaviour) may finally be accepted, internalized, and seen as ‘normal’. They explain why only a few people become violent radicals, regardless that many people are under similar influences in the same environment. Both follow a holistic approach, employing system dynamics theory and taking into account the relationships among the multiple variables of the problem. The comprehensive approach not only points to Operational Environment variables but also takes into account micro, meso and macro level approach. They use the approach of treating the problem like a system of systems which allows the user (planner, researcher or decision maker) to break it into smaller subsystems. The models permit the compartmentalization of knowledge. The student or the decision maker does not necessarily have to understand the whole process in detail. The expert (staff, teacher, etc.) can contextualize and then focus on the area of interest. If the student or decision-maker wants to explore a specific topic, the expert can go into the inner layers and proceed with an in-depth thorough explanation. The model can be particularized for each specific or exact kind of violent radicalism. The design of the model and the inner layers have been created in a modular fashion so they can be adapted to a particular kind of violent radicalism adding or taking away variables and/or subsystems. The design is modular which makes it resilient. Even if one of the subsystems is not well understood yet or it has not been well adapted to a specific kind of radicalization the model continues to work. Without knowing what and/or how the inputs of one subsystem are transformed into the outputs, the latter can be used to feed the next stages (new input of the next subsystem) to obtain a prediction about the process of violent radicalization. Since the problem is identified and it is contained in one subsystem researchers or planners can come back later to amend it. Subject matter experts (SME) can struggle, investigate or modify each different subsystems on their own or in a collaborative way if there is more than one involved. The new version of the subsystem of the inner layers will bridge with the next subsystem. It has been designed to be friendly to assessment. The model, at each of the different layers, facilitates the establishment of Measures of Effectiveness (MOE) or Measures of Performance (MOP). Subject matter experts will find enough relevant material in the inner layers of the model: indicators, actions and effects to link to the MOEs and MOPs. This is especially useful during the planning process, the preparation or the execution of a strategy, or one of its lines of effort/operations when addressing the problem. It is flexible. It lets the reader, commander/decision-maker or his/her staffs the liberty to be brief or to brief to a certain point, to proceed with an in-depth analysis, or to focus on a specific phase of the process by accessing the inner layers of the model. Perfect overview of the topic: undoubtedly the biggest advantage of the model is that it helps the user to create a deeper understanding of the topic of interest. Mind maps facilitate the learning process. Also they ease the transmission of information which is of the utmost importance in area operations where there are always rotations and shifts of new personnel (hand over – take over process). Connections. The model helps the user to focus on relationships and links that exist between variables. José Lorenzo-Penalva Lucas. Jefe del Departamento de Guerra Anfibia en Escuela de Infantería de Marina, Cartagena, España. See US ARMY ADRP 5-0 for more discussion on types of problems. To deepen into cognitive hierarchy see US ARMY ADPR 6-0 CH1 or NATO ATP 3.2.2. Among other see Blumenthal (1977), Kowalski (1991), Saaty (2008) or the US/NATO doctrine for the planning and decision-making process. System dynamics methodology was established during the 1950s by Professor Jay Forrester of the Massachusetts Institute of Technology (MIT). See Lane & Sterman (2011). For see instruments of national power see NATO AJP 01 ED E V.1 (2017). See the British author and scholar consultant Buzan, Tony. (1993). The Mind Map Book. International Centre for Counter Terrorism, ICCT. (2013). Radicalisation, De-Radicalisation, Counter-Radicalisation: A Conceptual Discussion and Literature Review. Center for the Study of Democracy. (2016). Understanding radicalisation. Review of literature. English translation and adaptation of previous definition of Lorenzo-Penalva (2017:22). The definition is consistent with most recent UNDP (2015:iii) and Schmid-ICCT (2013:18) definitions. Some of the experts that pinpoint this are: Schmid (2013:3) and Veldhuis & Staun (2009:24). For a more detailed review see Christmann, 2012; Borum, 2011b; Young et al., 2013. Pretch (2007:4) among others «General Intelligence and Security Service of the Netherlands (AIVD) and the Danish Security and Intelligence Service (PET) including Centre for Terrorism Analysis (CTA).». The word ‘political’ could be also an issue because violent radicalization is not uniquely a political matter. Quoting UNDP (2016:2): «These types of definitions lead to the view that organizations that foster radicalization are ‘conveyor belts’ to extremist violence. This view not only takes away the agency of the individuals involved, but it creates a tautological argument that allows for any group that is perceived to be radical to be persecuted by the state, in order to preserve the peace. This creates a dangerous precedent as political expressions such as protests and activism against “political oppression that, while illegal under national law, are accepted [in] international humanitarian law” can be grouped by as dangerous radicalism by an oppressive state which can then curtail such activities». For more discussion about the topic see Jenkins (2006) or Bakker (2012). Biconditional logical connective between statements (stages), equivalent to ‘if and only if’. If and only if condition X in 1st stage is achieved then progress to 2nd stage; etc. Behavioursim has its origin in Edward Thorndike who stated the law of effect at the late 19th century. Thorndike was contemporary of Watson and Paulov. Learning theories of Thorndike subsequently influenced to Skinner and Hull. In stages, not necessarily in time.